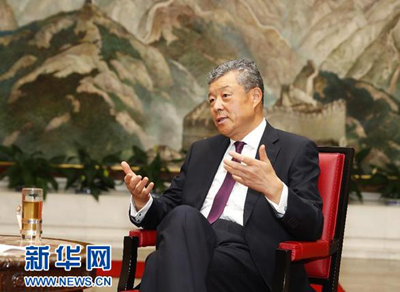 Chinese Ambassador to Britain Liu Xiaoming has said that China and Britain enjoy a mutually beneficial and advantage complement relationship in developing the Belt and Road Initiative, which has become a new highlight in the bilateral relations. The ambassador's comments came ahead of the opening of the Belt and Road Forum for International Cooperation, a high-profile international meeting on the China-proposed trade and infrastructure plan connecting Asia with Europe and Africa. 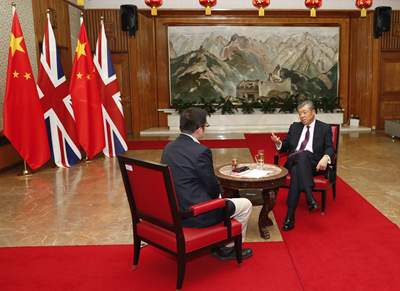 Liu told Xinhua in an exclusive interview on Friday that Britain boasts developed international finance industry, mature law and consulting businesses, world-renowned think tanks, top-notch science and technology and innovation platforms as well as its language, historical and cultural bonds with the countries along the Belt and Road initiative routes. "All these strengths and advantages that Britain has have well fit with the requirements of the Belt and Road construction," the ambassador said. " They put Britain in an excellent position to secure the opportunities the initiative has to offer." "The bilateral cooperation in economic and trade area has been strongly complementary while their cooperation in areas such as new energy, urbanization and green finance, has been growing," Liu said. Noting that Brexit will unavoidably bring some uncertainties to the bilateral cooperation though, Liu stressed that the opportunities in the development of the Sino-British relations are much more than the challenges. "The solid foundations, the internal impetus and the broad prospect of the China-UK relations have all remained unchanged," Liu said, adding that the Chinese enterprises' investment favor has shown the resilience and dynamic of the bilateral relations. Statistics show that China is Britain's second-largest trading partner outside the EU, while Britain is China's largest investment destination in Europe. Britain is now the world's second-largest offshore yuan center after Hong Kong.